"A Southern California judge has denied a defense request to delay the trial of a teen accused of murdering a gay classmate, Lawrence King. Ventura County Superior Court Judge Charles Campbell on Wednesday rejected the motion made by attorneys for 16-year-old Brandon McInerney," reports Associated Press. 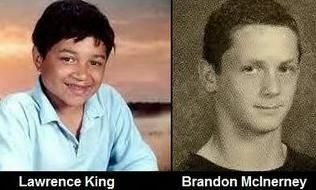 "McInerney has pleaded not guilty to murder and other charges for the February 2008 shooting of 15-year-old Larry King at E.O. Green Junior High School in Oxnard. McInerney faces a maximum prison sentence of 50 years to life if he's convicted of first-degree murder. Prosecutors have offered to agree to a sentence of 25 years to life if he pleads guilty to first-degree murder and a hate-crime allegation." Jury selection is expected soon, with opening statements slated for later this month.